WOW: "What A Day It Was"
Memories are our only connect to the times that have gone. While looking at the past is often condemned, recalling the good times never hurts at all. This weekend, we asked you to recall that one day that instantly bring a smile on your face! This week's prompt was-"What A Day It Was" and all of you made sure we had our day as well. We thank you for all the beautiful days you sent us wrapped in refreshing memories of happiness and gratitude. Here are all the beautiful posts that made us truly say- What a day it must have been! Thanks for accepting my post. 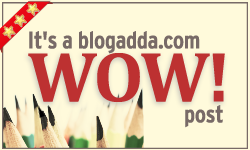 This is my first submission in blogadda. Hope the readers like it.